William McKinney was a drummer who by 1923 had retired from playing in favor of conducting and managing a big band. In 1926 his outfit became known as McKinney's Cotton Pickers, and the following year they scored a major coup by hiring arranger/altoist/vocalist Don Redman away from Fletcher Henderson. As the band's musical director, Redman put together an outfit that competed successfully with Henderson and the up-and-coming Duke Ellington. 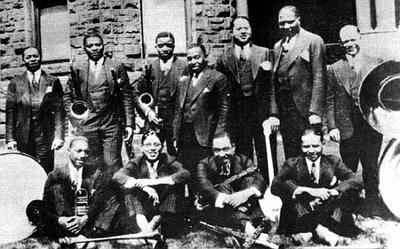 The lineup of musicians by the time they started recording in 1928 included Langston Curl, Claude Jones, George Thomas, and Dave Wilborn, but it was the advanced arrangements, the tight ensembles, and the high musicianship of the orchestra on the whole that was most impressive. There were a few special all-star sessions with such players as Joe Smith, Sidney DeParis, Coleman Hawkins, Fats Waller, and Lonnie Johnson making appearances, and James P. Johnson sat in on one date. Among the more rewarding recordings overall were "Four or Five Times," "It's Tight like That," "It's a Precious Little Thing Called Love," and four future standards that Redman introduced: "Gee Baby Ain't I Good to You," "Baby Won't You Please Come Home," "I Want a Little Girl," and "Cherry." It was a major blow in 1931 when Don Redman departed to form his own band. Benny Carter took over as musical director, but despite the presence of such fine players as Doc Cheatham, Hilton Jefferson, and holdovers Quentin Jackson, Rex Stewart, and Prince Robinson, there would only be one final recording session. The Depression eventually did the band in and after much turnover in 1934, the classic group broke up. McKinney organized later versions of the Cotton Pickers but without making an impression.